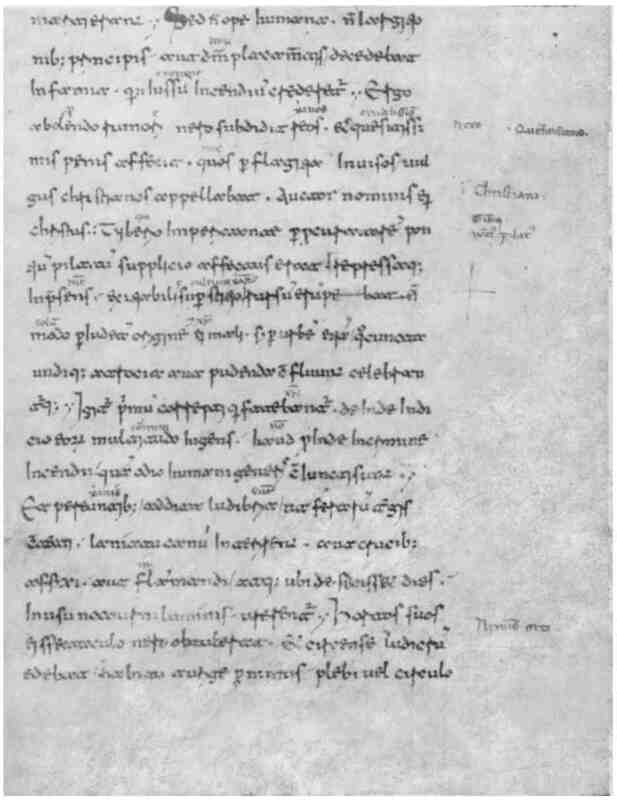 Claims by critics that the Tacitus account describing the Crucifixion of Jesus Christ, were written at too great a distance to the event to be considered credible, are without merit. Tacitus was 7 years old when the Great Fire of Rome took place, he was well aware of this massive inferno, which destroyed most of the city. Tacitus knew in great detail, the accusations of Nero and the reasons for which Christianity was spreading so greatly over the world: the Crucifixion and Resurrection of Jesus Christ. Tacitus never refutes either, and being that he was a patriot of Rome, he certainly was not sympathetic to Christians—whom he believed were responsible for the destruction of the city he loved. Tacitus simply recorded the facts of Jesus Crucifixion, as they were dictated to him by Nero and those who had first hand knowledge of the event. The record of Jesus’ execution by crucifixion under Pontius Pilate, written by Tacitus, is of immense value for the historicity of Jesus Christ. Being an independent source from both the Roman government and the Biblical text, Tacitus authenticates the narrative of the four gospels that Jesus was scourged and crucified exactly as the Gospels describe. Tacitus further describes the certainty that the Christians of this time believed that by drinking the blood and eating the body of Jesus of Nazareth, who was described as the “Christ”—those who believed could live forever. The fact that Tacitus and the history of the Roman government records the same events occurring during the same period of history that the four Gospels record these events of Jesus’ life, death, and resurrection—should cause any serious historian to conclude they are authentic. There is no contradictory evidence in any of the writings of Tacitus that controverts the New Testament narrative of Jesus Christ. Tacitus displayed no favoritism nor sympathy towards Jesus or the new Christian church. The tone in which Tacitus describes Christians is both hostile and negative—so much so, any reader would never conclude that Tacitus was trying to record events to assist the Christian message, nor authenticate or validate Jesus as the Messiah, whom the Christian church claimed Him to be. Due to the compelling testimony of a non-Biblical source which validates from the historical record that Jesus of Nazareth was a real person who died under the Roman governor Pontius Pilate, the writings of Tacitus have come under great criticism and scrutiny. According to Clarence W. Mendell, John Wilson Ross, and Robert Van Voorst, who have written extensively on Tacitus—regarding a 19th century hypothesis—which claims that the Annals of Tacitus were fabricated by 15th century Italian author, Poggio Bracciolini, is false and never proven credible by any recognized Biblical scholar. Jesus & the Rise of Early Christianity: A History of New Testament Times by Paul Barnett 2002 ISBN 0-8308-2699-8 page 30. Clarence W. Mendell, Tacitus: The Man And His Work (Yale University Press/Oxford University Press, 1957) page 219. John Wilson Ross, Tacitus and Bracciolini: The Annals Forged In The XVth Century ISBN 978-1-4068-4051-3. Originally published London: Diprose and Bateman, 1878.